Once frequently played on board passenger ships, deck tennis is an easy to learn game that has rules similar to conventional tennis. 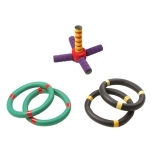 The Champion Sports Deck Ring Set includes 12 rings made of sponge rubber. Players simply set up a net or boundary line and toss the ring to the opposing side. Players must catch the rings to prevent their opponents from scoring and toss them back over. Points are earned when you land the ring inside the court on the opposing side. 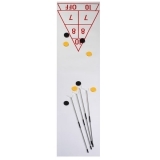 The Champion Sports Economy Shuffleboard Set has everything you need to set up a game of shuffleboard indoors or outdoors. The set includes a 15' plastic court and four cues, along with shuffleboard discs and playing instructions. The Champion Sports Foam Croquet Set is a safe alternative to traditional wooden croquet that provides a game of fun and accuracy for the whole family! The set includes six 28" mallets, six balls, nine weighted foam covered wickets, and two stakes. The set comes packed in a handy carrying case for easy storage and transport. 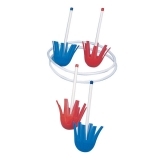 Kids of all ages can enjoy the Champion Sports Foam Ring Toss Set. 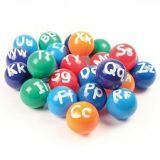 It is safe for young children and a great way to improve hand-eye coordination. 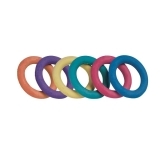 Each set comes with colored rings and a soft foam base. The Champion Sports Indoor/Outdoor Horseshoe Set is a safer and softer alternative to traditional steel horseshoe sets. 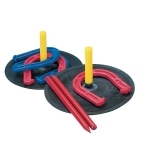 Each set includes four rubber horseshoes, and two rubber mats with pegs and plastic dowels. 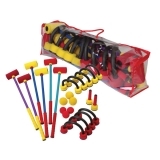 The Champion Sports Jump Rope Stick Set is a great tool for teaching children how to jump rope. As the rope extends, kids hold onto the 36" plastic baton, swing the rope, and jump! 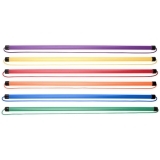 Each set includes six jumping sticks in a variety of rainbow colors. The Champion Sports Ladder Golf Set only takes minutes to set up and provides hours of fun at the beach, park, or your own backyard. 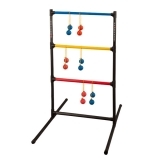 This set includes two plastic ladders with a deep base for stability, and six bolas (two weighted sponge golf balls connected by a string). Earn points by throwing the bolas at the different color rung targets! 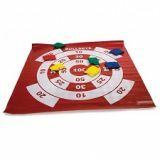 The Champion Sports Lawn Toss Game is a safe and fun way to get outdoors and test your aim. Place the target rings on any lawn or open area and simply toss the plastic lawn darts towards the target. 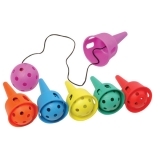 Each set includes four weighted mushroom shaped toss ups, and two plastic target rings. 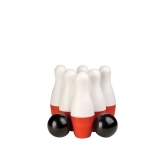 The Champion Sports Mini Bowling Set has the look of a real bowling ball and pins in a smaller size. It's great for all ages and helpful in developing bowling skills safely at home. The set includes 6 mini bowling pins and two 4" bowling balls.